WASHINGTON (CNS) — Along the western banks of the Jordan River, the place of Christ’s baptism and today known as Qasr al-Yahud, numerous churches and monasteries of different religions sit vacant and silenced due to the dangerous landmines that lie beneath them. For almost 50 years, Qasr al-Yahud has been empty due to the landmines installed during the 1967 Six Day war between the Arabs and the Israeli people. Halo Trust, a nonprofit organization, has worked to remove the landmines in the Qasr al-Yahud area since 2012. The group is dedicated to providing save environments for those living in areas surrounded by landmines through landmine removal, as well as assisting in local community rebuilding in the aftermath of war. Their work has brought together various religious denominations in efforts to preserve the sacred churches, such as the Coptic church, the Franciscan church and the Syrian church, that all sit on the site of Qasr al-Yahud. “We’ve got agreements with the eight churches, we’ve got agreements with the Israeli government, and we’ve got agreements with the Palestinian authorities,” said Adam Jasinski, executive director of Halo Trust, in an interview with Catholic News Service July 15. Jasinski spoke about the Jordan River landmine removal in a seminar at the Franciscan Monastery of the Holy Land in America as part of its fourth annual Holy Land Festival held July 15. The festival cultivates a conversation of hope around the Holy Land, with many groups coming together to engage visitors with the situation of Christians and of peace in the Holy Land. 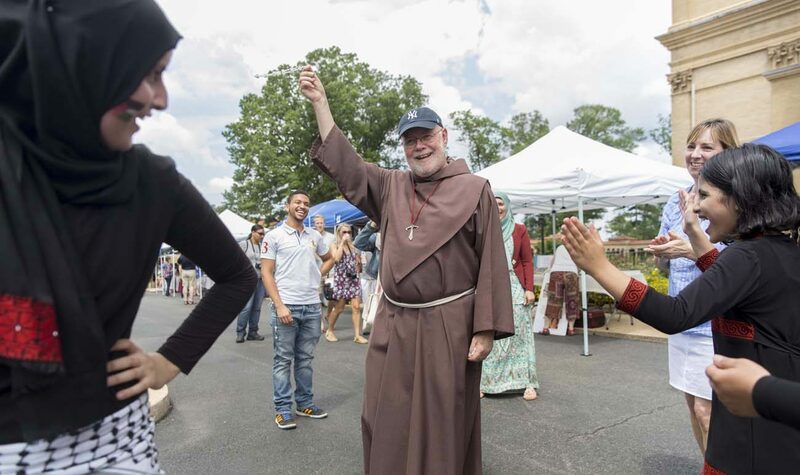 Father Jim Gardiner, a Franciscan Friar of the Atonement as well as a member of the Holy Land Committee of the Archdiocese of Washington, spoke to CNS about how the festival brought together so many different groups of people. “Nobody knows who is Christian, Muslim or Catholic,” Father Gardiner said. The interdenominational environment at the festival was a mere taste of what takes place at Bethlehem University, the first Catholic university in the Holy Land. Two Bethlehem University students, Lela Abu Ayyash and Lara Kasbari, spoke about their experiences living and going to school in Palestine during the Holy Land festival in a seminar. Bethlehem University contributes to a peaceful conversation among its 3,200 students, 77 percent of whom are Muslim and 23 percent, Christian. The university also hosts several prayer hours throughout the week where Christians can go to a church and Muslims can go to a mosque, all to engage in prayer at the same time. The festival engaged visitors in an authentic atmosphere as the smells of Middle Eastern food lingered on the sunny Saturday afternoon and the traditional music and dancing took place in the center of the square. Visitors also went inside to tour the monastery’s church and catacombs which hold many replicas of Holy Land sites.